This week we are wrapping up TCM’s 2013 31 Days of Oscar. I hope you’ve been able to find some new favorites through this and weren’t overwhelmed with my having 25 must-sees listed at the bottom of every post. Also, thanks so much to everyone who participated in the Oscars Twitter Party last night! We’ll do another movie night Twitter party sometime soon! TCM saved a lot of great ones for this last week, so this was a really tough choice, especially since one of my all-time favorites, The Best Years of Our Lives, is airing later this week. However, I’ve already featured that one here, so while I must insist you also watch it, I wanted to highlight a new feature while I had the chance. Leonard Vole (Tyrone Power, in his final film before his own heart attack) is an ex-servicemember who’s something of a drifter. He hasn’t had any steady employment since WWII and doesn’t seem to be motivated to learn a trade. He likes to invent gadgets and try to market them, but he’s no good at marketing either. 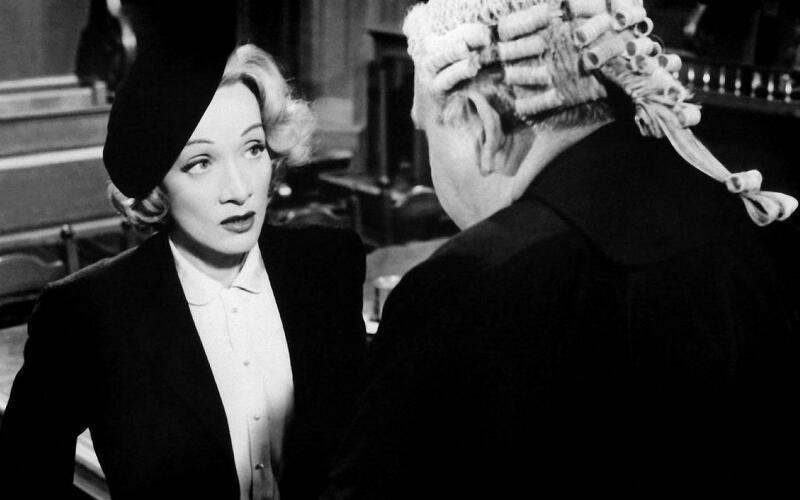 So he goes from odd-job to odd-job barely making ends meet for him and his wife, Christine (Marlene Dietrich). One day he meets a wealthy older widow, Mrs. French (Norma Varden) and, through a series of random encounters, becomes friends with her. She treats him like a pet nephew and he keeps her company at the movies or for dinner. Suddenly, Mrs. French is brutally murdered. When it comes to light Mrs. French redrafted her will naming Leonard as her sole heir, he is instantly suspect #1. He had motive, means, opportunity, and his alibi is that he was home alone with his wife at the time of the murder. He insists he’s innocent, but every bit of evidence is against him. Exactly the challenge to intrigue a lawyer like Sir Wilfred. Unfortunately, the their last gasp for hope is lost when it comes to light that Christine will not testify in Leonard’s defense. 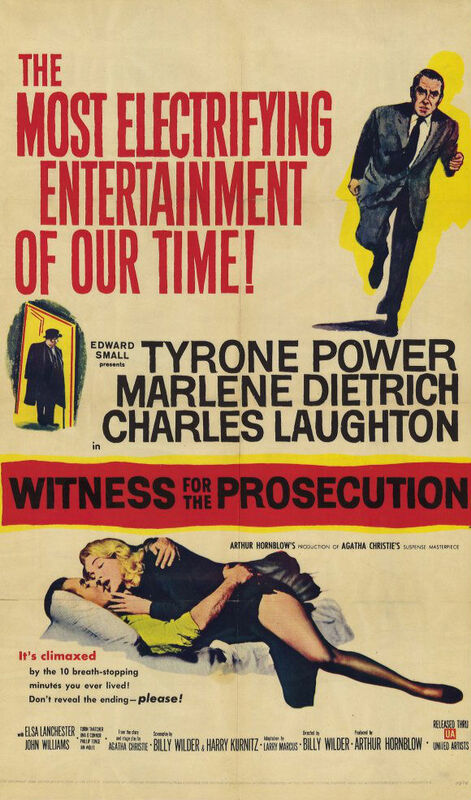 She has agreed to testify as a witness for the prosecution – their star witness – that Leonard is in fact guilty of the murder. Christine already told Sir Wilfred in confidence that Leonard’s alibi was true and he couldn’t have committed the murder, so why is she going to lie and testify against him? If he is convicted, it’s the death penalty. Can Sir Wilfred save Leonard now? "The management of this theatre suggests that for the greater entertainment of your friends who have not yet seen the picture, you will not divulge, to anyone, the secret of the ending of Witness for the Prosecution." Of course, it is set in England (Agatha Christie was British, after all), and the British justice system, while similar to ours, is slightly different, both in style and in mechanics. There are brief conversations explaining the relevant differences, and that helps. But don’t be discouraged if you’re used to a “Law and Order” style TV courtroom. In the end, the basics are similar enough. And even though this is a suspenseful movie about a tricky murder trial, there is a healthy level of humor throughout the movie. It’s verbal, sarcastic, punny and clever, the perfect British influence but still good for an American audience. “He died in 1945…of a heart attack.” “Please, Mayhew! Not while I’m smoking!” *snicker* Right up my alley. 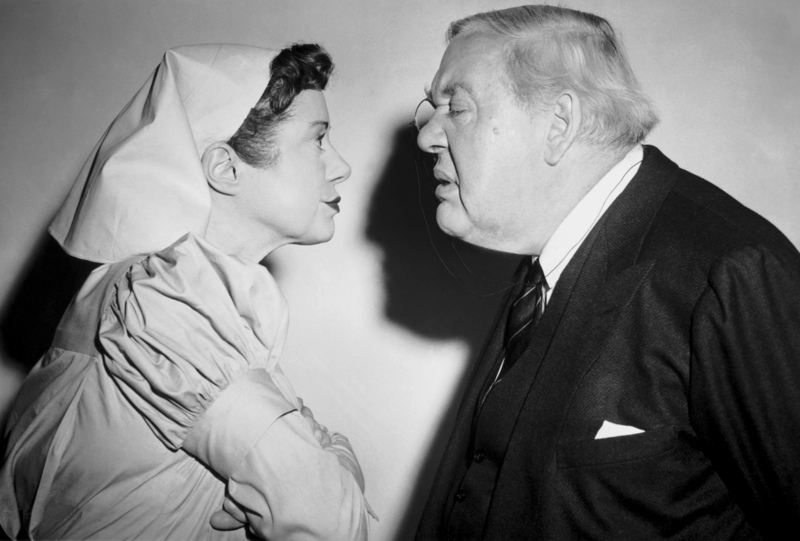 The cast is a riot, primarily Charles Laughton and his wife, Elsa Lanchester, who plays Sir Wilfred’s micro-managing, insensitive nurse. They go back and forth throughout the entire movie and it’s a hoot. Tyrone Power was one of my favorite actors as a kid, and he shows a wide range in his role as Leonard Vole, a man whose fate is almost totally out of his own hands. 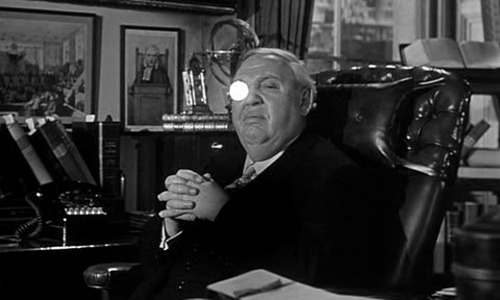 “Witness for the Prosecution” will be on TCM on Friday, March 1, at 11:45 pm CST. It is also available on Netflix streaming if – like me – you can’t wait that long.